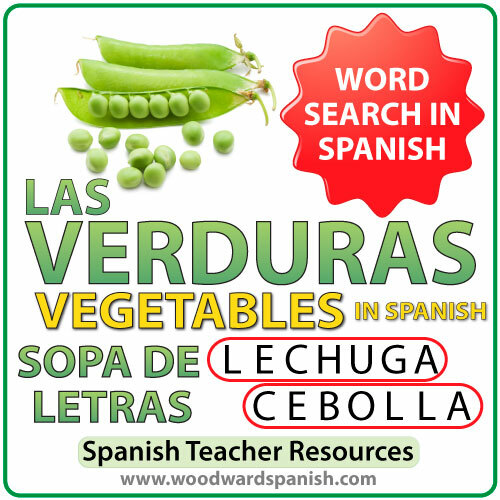 Word Search activities about the names of vegetables in Spanish. One word search contains the following 21 Spanish words: acelga, alcachofa, apio, berenjena, brócoli, cebolla, champiñón, col, coliflor, espárrago, espinaca, guisante, lechuga, lombarda, maíz, patata, pepino, puerro, rábano, remolacha, zanahoria. There is another version of this word search where we have exchanged 4 of the words because of regional differences: papa instead of patata, repollo instead of col, arveja instead of guisante, and choclo instead of maíz. You choose which worksheet is more appropriate for your class. 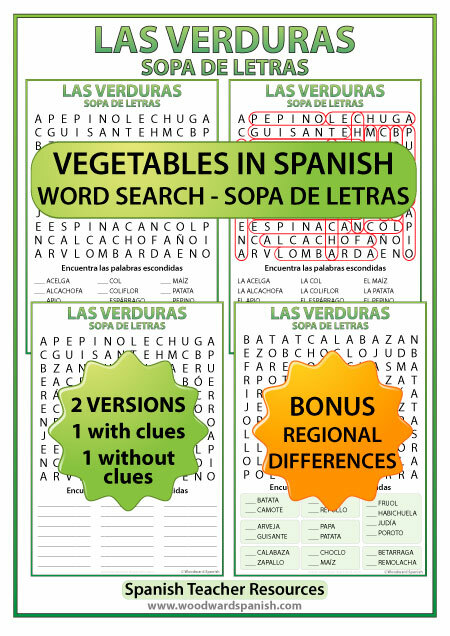 BONUS: We have included another word search with regional differences in the names of vegetables in Spanish. It compares the following vegetables: batata, camote, arveja, guisante, calabaza, zapallo, col, repollo, papa, patata, choclo, maíz, frijol, habichuela, judía, poroto, betarraga, remolacha. One worksheet is without clues. There are lines (spaces) where students have to write the names of the vegetable that they have found. This worksheet is good for students that have already seen this topic or are normally fast finishers. Una sopa de letras tiene las siguientes palabras:acelga, alcachofa, apio, berenjena, brócoli, cebolla, champiñón, col, coliflor, espárrago, espinaca, guisante, lechuga, lombarda, maíz, patata, pepino, puerro, rábano, remolacha, zanahoria. Hay otra version de esta sopa de letras con la palabra patata en vez de papa, repollo en vez de col, arveja en vez de guisante, y choclo en vez de maíz. Otra sopa de letras muchas unas diferencias regionales de los nombres de algunas frutas. Tiene las siguientes palabras: batata, camote, arveja, guisante, calabaza, zapallo, col, repollo, papa, patata, choclo, maíz, frijol, habichuela, judía, poroto, betarraga, remolacha.